We offer you to choose from a wide assortment of step and cone drills. You can use manufacturer, diameter, shank diameter and other filters. 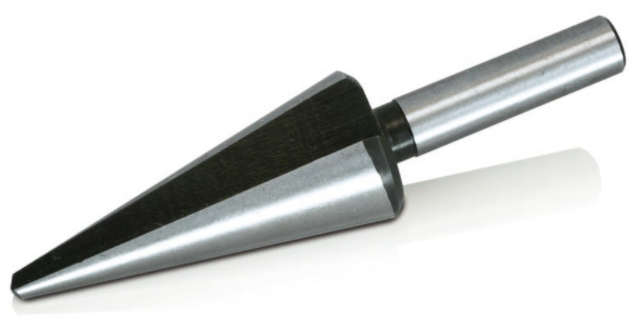 Step and cone drills are used to drill sheet metal and other thin metal workpieces. Special design of cutting edge allows smooth drilling with no stuck in workpiece, getting hole with clean edges and no surface deformation. You will never get goods results, if you use conventional metal drill for thin metal drilling, because the cutting edge is constantly jamming, the drilled hole will be irregular, its edges will be uneven and deformed. 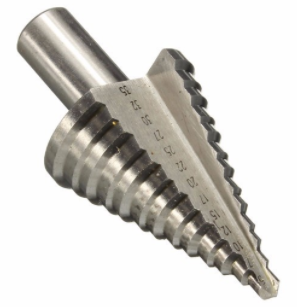 Two types of drills are used for sheet metal drilling: cone drills and step drills. Cone drill body have a cone shape with a cutting edge along this cone. Most important cone drill specification is drilling diameter, which is indicated by the range from minimum to maximum drilling diameter (eg: 4 - 32 mm). During drilling process you will get a bigger diameter hole if you push drill bit deeper into the workpiece. Step drills are very similar to cone drills. The only difference is in the shape of cone body. Step drill have a certain diameter steps, so pushing drill into material untill you reach choosed step you can get hole in an exact diameter. In most cases, the diameter in millimeters (eg: 4; 6; 8; 10; 12; 14; 16 mm) is indicated next to the cutting edge at each step.